Pretty cool pumpkin and gourd carving ideas for this Fall and Halloween season....so forget the traditional jack o' lantern and try of few of these pumpkin carving ideas for your Fall and/or Halloween decorating fun! 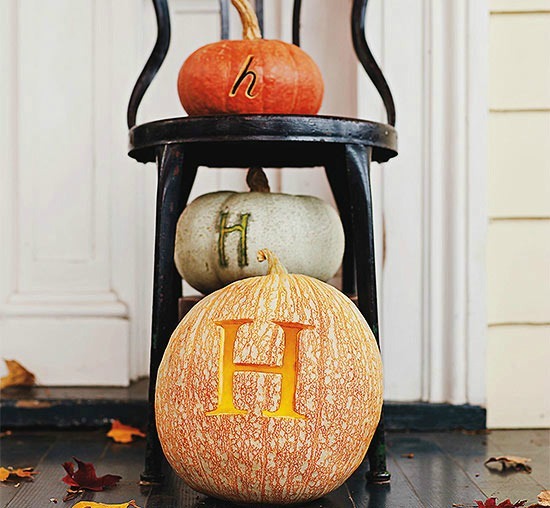 Welcome guests to your home with these decorative monogrammed pumpkins that are simply elegant. 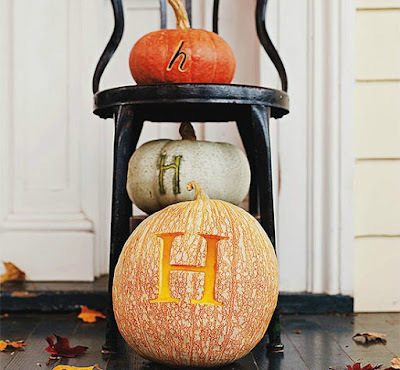 To make these cool pumpkins, print letters (either your initials or one for each member of your family) in your favorite font. Transfer the designs to pumpkins and carve, either cutting all the way through the pumpkins or gouging out the top layer. Your car aficionado will love this pumpkin road duo. Download the patterns; transfer to your pumpkins and cut the opening to on the bottom of your finished design. Cut out the windows and windshield. Then use a gouging tool to outline the car and camper doors. Cut out a small rectangle under the camper door, and wedge in a scrap of pumpkin for the threshold. Embellish the car and campers with wheels, door handles, and curtains using pieces of small, colored gourds; secure with toothpicks. 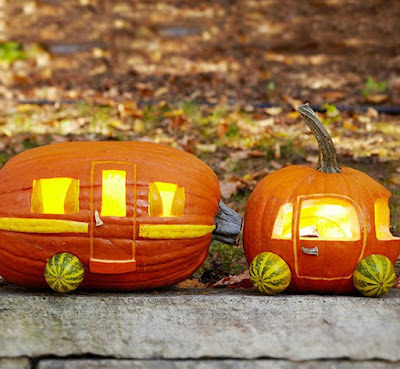 Cut out a stripe along the camper and insert a long strip of gourd to finish. Smooth-skin gourds are a great way to add cool pumpkin carving to your decorating repertoire. Choose varieties in distinctive seasonal colors, such as yellows, greens, and reds. 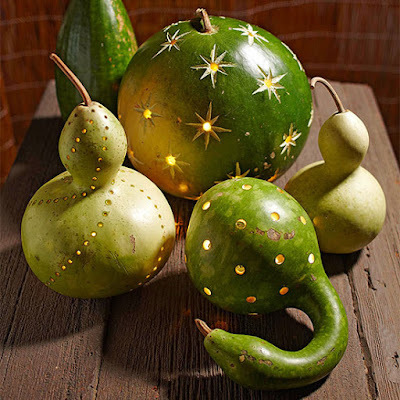 To create these luminarias, cut a hole in the side of each gourd large enough for your hand; scrape out the inside. Mark your chosen design on the gourd using a pencil or ballpoint pen. Carve the design with an awl, paring knife, or crafts knife, or use a power drill and different-size bits. Illuminate the gourds with strands of LED lights. When it comes to cool pumpkin carving ideas, it doesn't get much more amazing than a colorful stack decorated with flowers, swirls, and dots. Find three flat-bottom pumpkins in graduated sizes and different colors. Without hollowing them out, use a 3/4-inch hole-saw bit and drill circles in different patterns and shapes. Switch the resulting "plugs" between different pumpkins for extra pops of color, then use a vegetable peeler to etch the swirls. 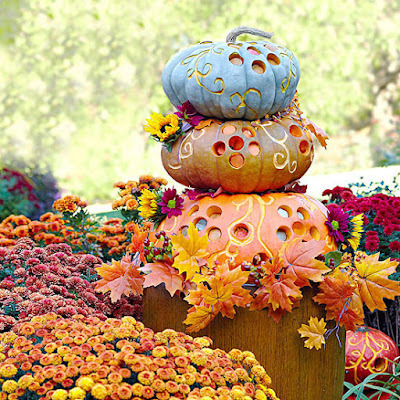 Finally, remove the stems from the two larger pumpkins and stack them. Elevate them on a pedestal, doorstep, or wooden barrel. 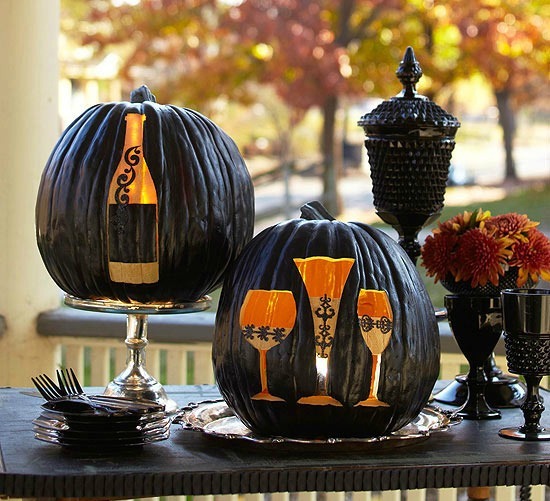 Great for a Halloween party buffet decoration as well as a front porch accent, these sophisticated pumpkins are easier to make than they look. 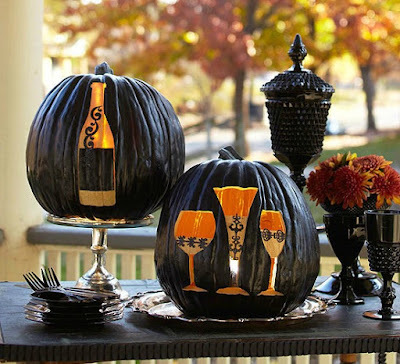 Download the patterns and transfer to two real or faux pumpkins; carve out the top and bottom areas of the glasses, then outline the center area of each glass and the bottle. Outline the decorative details on the glasses; gouge the areas inside the outlines and around the details until smooth. Outline the label and the bottle curlicues; lightly gouge the rest of the area inside the bottle outline to make it smooth. Architecture takes over in this pumpkin carving, which transforms the orange orb into a Halloween-friendly belfry. 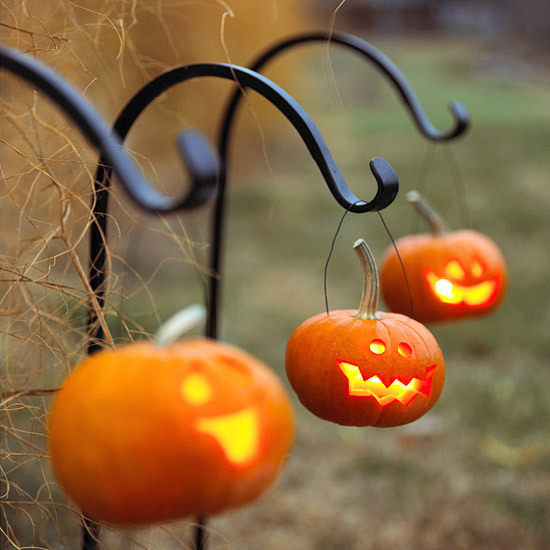 Accent your pumpkin with paper or plastic bats, or carve an attic or single window instead of a belfry. 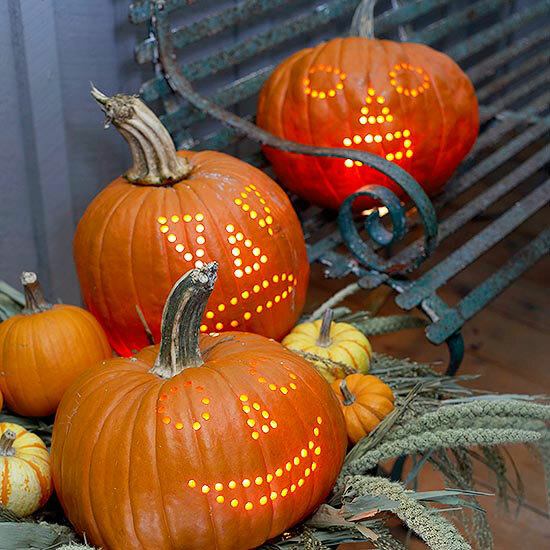 Light up your walkway for trick-or-treaters this Halloween with miniature pumpkin luminarias. Small to midsize pumpkins work perfectly for this easy carving idea -- just hang a series of these carved faces along a sidewalk using heavy-gauge wire and shepherd's hooks. Skip the candles in place of battery-operated lights. Take an easy pumpkin carving pattern, add flowers and greenery, and voila: floral-enhanced jack-o-lanterns! 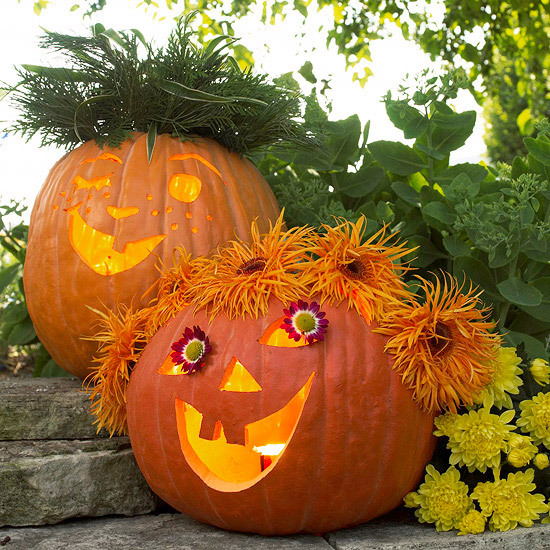 Happy faces are quick to carve, and cheery colors add a light and bright touch to this autumn duo. If you have a little more time, you'll have fun pulling together this cool carving idea. Add the bonfire centerpiece to a backyard table or use it as a focal point in front. 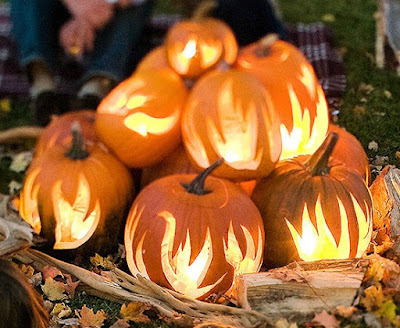 You'll need about 10 to 12 pumpkins and flickering candles to make these flames come to life. 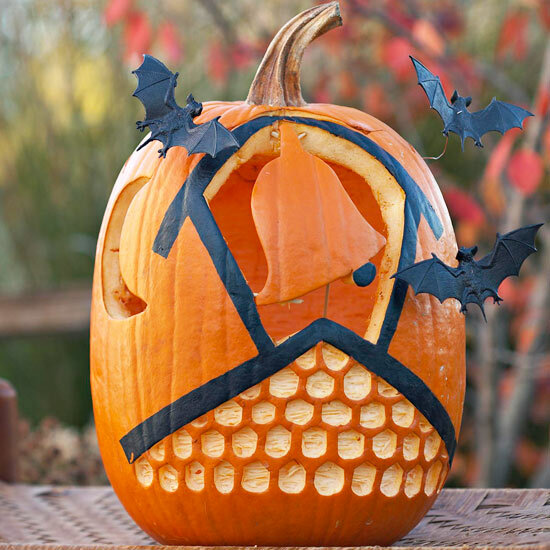 Make quick work of easy pumpkin carving with everyone’s favorite tool: a drill. Start with a quick sketch of your design and use a drill with a small bit to create evenly spaced holes on the pumpkin. Tuck in a strand of LED lights for constant illumination.